Our relaxing area at La Coustille: sauna, jacuzzi, spa, massages. At the heart of the « Massif du Champsaur », you log off from the real world and you take care of yourself by long walks in the fresh air, enjoying healthy, local produce and you regenerate in the sauna and jacuzzi before a massage provided in a warm atmosphere ... Everything is here to log out and give you a sense of harmony with nature. Discover a world apart where the wellness experience is total. The price for our 30' sessions in the SPA is 19€ per room (not per person) and is privatised so every guest can fully profite from the relaxation. The sessions are organized in the afternoon from 4.30 pm till 7 pm, following a planning that's concluded each morning in accordance with the demands. Our SPA erea is open in winter from October till May. In summer (June till September) you have access to our outside heated pool with scenic view of the surrounding mountains. 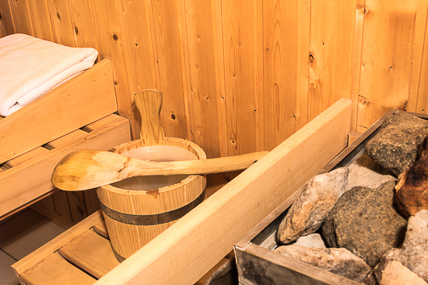 After your hike or ski day you can enjoy the wellness rituals from Finland. The sauna, hot and cold alternation give multiple benefits to your body and mind. The relaxing action of the Sauna: A sauna session will be beneficial to resist against stress and tension. Under the influence of heat, the body releases endorphins that foster sleep and relaxation. The purifying action of the sauna: Dry heat sauna causes dilation of skin pores. The warm-cold effect stimulates blood circulation. The Guest House La Coustille offers massage** sessions (upon reservation) performed by qualified professionals providing comprehensive care tailored to each person. Californian massage : relaxing comprehensive full body massage with essential oils for wellness and immediate relaxation. Foot massage (reflexology) : foot massage combined with Asian techniques. Lymphatic Drainage : manual lymphatic drainage using the technique "Leduc". Swedisch massage : A deep, muscular massage much appreciated by sportsmen. It's both a precise and enveloping message, thanks to an alternation of sliding profound pressures, kneading and effleurages. Price for a Massage : 65€ per person for 50 minutes. In the process of Room reservation you will be able to reserve the option of your choice. Prior appointment necessary, Confirmation depending on the availability of the therapists. ** The term "massages" is used only to translate foreign techniques into occidental language. These "massages" are only for ralaxation and are nontherapeutic ; they do not ressemble any western medical or paramedical practice.